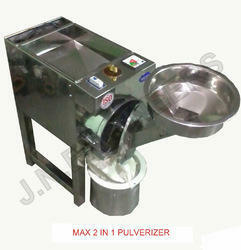 Our product range includes a wide range of max moon white (toky) flour mill and max 2 in 1 semi pulverizer. Features: • 1 Hp power saver single faze motor • 5 kg. Hopper capacity • 6 - 8 kg. / hour grinding capacity (normal jelly) Consumes 1 unit / hour. 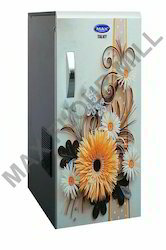 • ISI plywood and MDF cabinet • Stainless steal hopper • Aluminium cast one piece chamber • M.S. Forging process and zinc coated cutter • Stainless steal six blade zinc coated and balanced bitter • Good electronic talky automatic control system • Over load protection • No noise and no vibration • Auto start, auto grind, auto clean and auto stop system • EGS technology ( “easy grinding system “) Dimensions and accessories : • 305 width x 457.2 length x 762 height mm approx • 50. Kg. Weight approx. • 1 & 10 stainless steal jelly set. • Plastic filter, stainless steel container, chamber cleaning brush, caster wheel. Features 2 HP 2880 R P M Good motor stainless steel body one peace die cast Aluminum chamber M S steel cutter 4 blade M S steel bitter overload production electronic control Dimensions and accessories 310 width x 610 length x 810 height mm. Approx. 60 kg. Weight approx. 8 jelly, stainless steel containor, plastic ring, cotton bag, chamber cleaning brush, caster wheel.. Looking for Max Commercial Flour Mill ?